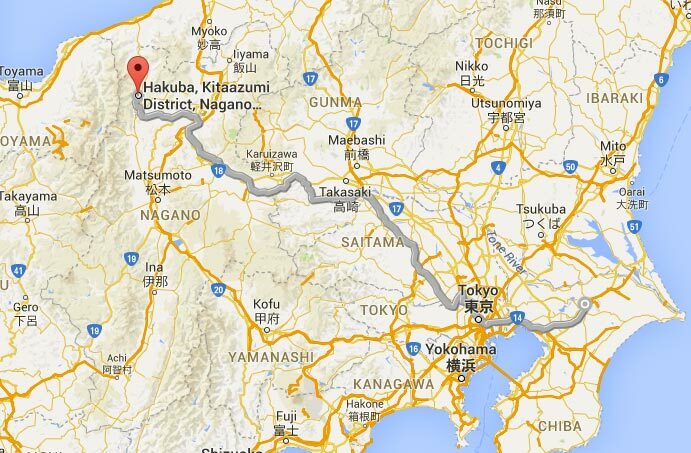 Though it may seem overwhelming, travel from Tokyo or Narita to Hakuba is not complicated. Public Transport in Japan is very efficient and always on-time. If you have luggage and children and are coming directly to Hakuba from the airport, the Chuo Taxi is probably the easiest way to travel. If you’ll be staying in Tokyo the Keio Highway Bus from Shinjuku is the simplest, but a trip to Japan also isn’t complete without relaxing on the Shinkansen (Bullet Train) and watching the landscape fly by…the trains are fast, but remember you’ll be lugging your bags around so if you have 4 kids, 15 bags and a confused spouse things can get stressful. Check out the range of travel options from Tokyo / Narita to Hakuba below. Chuo Taxi – the nicest way from Narita to Hakuba. If navigating platforms and lugging your bags around as you transfer from train to train or train to bus is not your thing the taxi service offered by Chuo Taxi is definitely the easiest way to travel. Bookings are available from 1 person and the price is set per person regardless of whether you are travelling alone or with a group. You must book 5 days in advance and the taxi will be waiting for you at the airport and will take you directly to your hotel. Nagano Snow Shuttle – daily service direct from Narita Airport to your Hakuba Hotel! New direct bus service organised by local travel agent JHN Travel (Hakuba Hotels). Prices a little cheaper than Chuo Taxis; make sure the time suits your flight arrival though as there is only one bus a day departing 8 or 9 PM; Chuo is the better option if you arrive early and don’t wish to wait, or if you arrive later than this. 1: Bullet train from Tokyo to Nagano, transfer to bus from Nagano to Hakuba. B. At Nagano station, go to the east exit and find bus stop #6. The bus bound for Hakuba destinations leaves roughly every hour from 8:20 to 20:30 and costs 1400 yen. Please check with the Alpico website for updated times and info. Please remember that the last departing bus to Hakuba from Nagano station is at 20:30 – you have no public transport options to Hakuba after this time. 2: Shinkansen to Matsumoto, transfer to train from Matsumoto to Hakuba. Take the Chuo expressway to Okaya Junction and transfer to the Nagano expressway; exit at Toyoshina. Follow the signs to Hakuba, which will take you through Omachi on to #148 and Hakuba. Take the Kan-Etsu expressway to the Fujioka Junction and transfer to the Joshin-Etsu expressway, exit at Nagano. Follow the signs to Hakuba first along route 35, then turn left on route 19. You will then see a turn to your right to Hakuba on route #31/33.